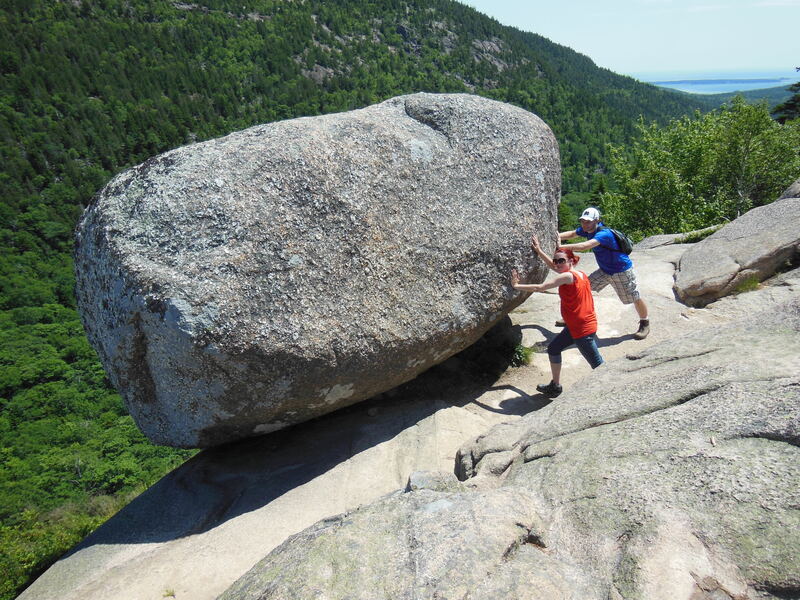 I advocate healthy exercise, like trying to push a giant boulder off a cliff. This week, I wrote a guest blog for Kate Daigle Counseling on a topic I’ve addressed here before: “fitspiration” and the dangerous line it walks between promoting health and fitness and encouraging a disordered fixation on the extreme. It’s a topic that’s at the forefront of many of our minds, especially given the recent “Biggest Loser” weight loss scandal. See the original here. The text is also below. I called it the “tyranny of the numbers.” I couldn’t be content to run x number of miles, burn x number of calories or spend x amount of time. The three x’s had to line up, like pictures on a slot machine, for me to hop off the treadmill satisfied. Bingo. In this way, my compulsive exercising brain held my body captive, tied to a treadmill until one would let the other stop. If I skipped a day, I hated myself, my body, the weakness that I thought resting implied. I counted calories like I counted steps, minutes: obsessively. This was not fitness. This was an exercise in illness. A person only need spend five minutes on Facebook, Pinterest, Instagram or even Twitter, to notice the “Fitspiration” trend that’s taking over social media. Slogans like “unless you puke, faint or die, keep going” and “No matter how slow you go, you’re still lapping everyone on the couch,” slapped across photos of tight bodies in tighter clothes flash across the screen in the name of fitness. But what are they really saying? After years of fighting it, I’ve learned to listen to my body telling me what it needs. My body isn’t a machine and it isn’t a tool. It’s a part of me, and a part that I love and respect. If it’s fainting or puking, there’s something wrong. That isn’t fitness; that’s illness. And no matter how slow I go, my body still needs rest days. It needs the couch, sometimes. And yes, it often needs potato chips and chocolate, too. And if I don’t give it some off time, my body will break down. Or my mind will, because neither can exist at maximum capacity for long without falling to pieces, because neither were made that way. That isn’t fitness either. But I can tell you what it is. It’s a culture trying to sell fitness by encouraging shame in our bodies. Fitspiration encourages pushing a person’s body to the limit and beyond, implying that any less is failure. It’s an all-or-nothing attitude that isn’t just discouraging; it’s dangerous. Women are already taught that we’re not good enough. We’re taught that our bodies are imperfect, our efforts are less valuable, our work is worth less. None of these are true, but all of them sell beauty products, self-help gear and yes, workout clothes. We have to look beyond the fitspiration messages and realize that slogans that subjugate aren’t selling us anything we should be buying. That we’re stronger, smarter, better than that. True fitness, the kind that leaves a person feeling better and living healthier, has nothing to do with fainting and puking. It doesn’t require, or even usually result in, glistening muscles rippling beneath branded spandex. And most of all, real fitness makes a person feel better, not worse. Because my personal fitness level, no matter where it is, is nothing to be ashamed of. These days, I don’t treat a treadmill like a slot machine, just like I don’t treat my body as a vessel that needs punishing. I put a book over the numbers, cue up my favorite podcast and exercise until a chapter break, the end of the broadcast or my body tells me to. No matter what the numbers say. Thank you to Kate for allowing me to write on her platform!